The CST B-Trail mountain bike tire is a versatile trail tire sure to make your jaw drop. 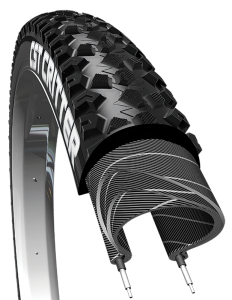 The CST B-Trail’s unique tread pattern features short, alternating knobs on the center tread for exceptional traction and lightning-fast speed. The side knobs are taller and more aggressive to ensure confident, flawless transitions coming in and out of turns. The CST B-Trail is available in folding bead with CLXX technology (170 TPI), making it one of the lightest mountain bike tires in the CST lineup.